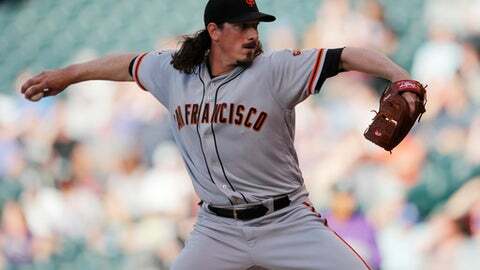 DENVER (AP) San Francisco Giants right-hander Jeff Samardzija was forced to leave his start against Colorado after pitching one inning Tuesday night because of tightness in his pitching shoulder. Samardzija threw 23 pitches in a rough inning and allowed three hits and two runs before exiting with the injury. He was replaced by rookie righty Dereck Rodriguez, the son of Hall of Fame catcher Ivan Rodriguez who was making his major league debut. The 25-year-old Rodriguez had his contract purchased Monday from Triple-A Sacramento. He was 4-1 with a 3.40 ERA in nine starts for Sacramento. Rodriguez was originally drafted in the sixth round of the 2011 draft by Minnesota as an outfielder. He made the transition to pitcher two years later.